I'm back in Margaret Moseley's garden in east Atlanta. There's something I've been trying to figure out for over two decades now. This is a magical garden. Practically everyone who has stepped into her back yard has felt that it is different from other gardens. But what is it that makes it such an appealing place? This photograph gives me a hint. I've always thought one factor was the way light falls into the garden almost all day long. Here, you can see how light and shadows play. Of course, Margaret's success lies in the plants she chooses and where she places them. 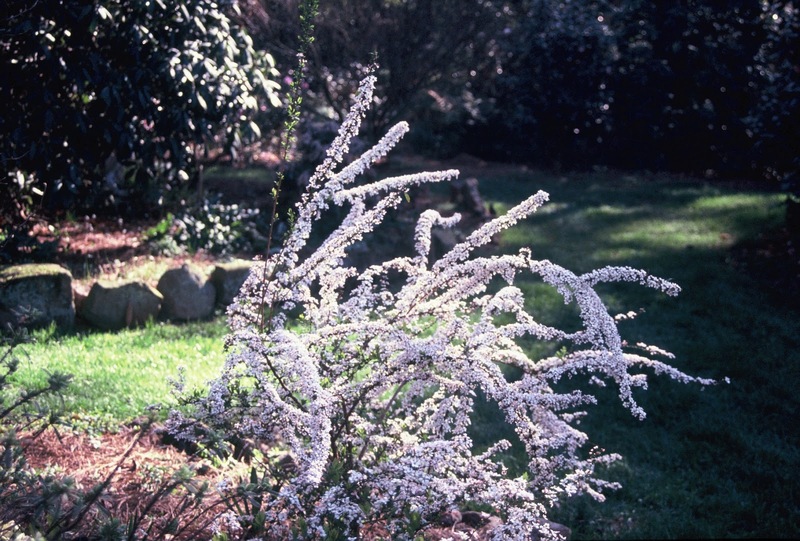 This is Spiraea thunbergii 'Fugino Pink', one of the first spiraeas to bloom in late winter. The irregular shrub is almost like a wild sculpture, seen against a darker background. Margaret gave me one of these plants. I parked mine in a shrub holding border where things will stay until I figure out my deer problem. Instead of growing to its normal height of three to five feet, my plant formed a couple of thin, upright shoots that are taller than I. Miraculously, the deer haven't lopped off the blooms. After it has finished flowering (which it is doing now), I'm going to cut back those long leaders and try for a more proportionate plant. I want mine to look like Margaret's. But to highlight a shrub like this, I need more evergreen backdrops. At the core of Margaret's irregular beds are large camellias and sasanquas. Although there are no formal lines in her garden, she's made sure the deciduous flowering plants not only get the proper light but have a background that will be complementary. I think this is a natural instinct with her, part of her extraordinary vision for how to make a plant look its best. 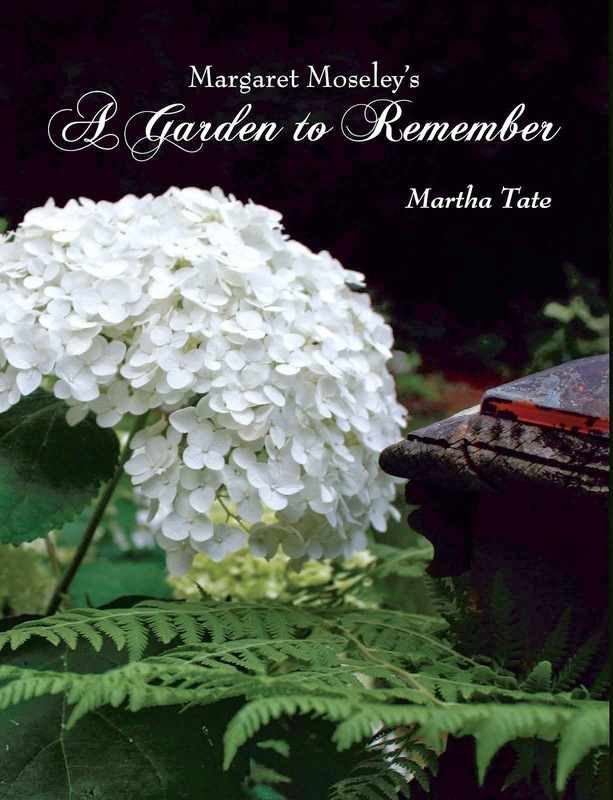 I'm frantically putting a book together of photographs of Margaret's garden, along with anecdotes, her famous sayings and hints for making a successful garden and stories about how far and wide her influence has been. After reading dozens and dozens of articles about her, one thing stands out. She has enjoyed every minute out in this garden, constantly changing things up, adding and subtracting where needed, even cutting down beloved trees (a Prunus mume, for example) that no longer worked. The garden has also been a factor in maintaining good health into an advanced age (she'll be 97 in May). I came across this photograph while looking back through some forgotten files I had for the Atlanta Journal & Constitution. Somehow, it seemed to capture the essence of this extraordinary garden - the placement of the plant, the way the light falls on the flowers and the surroundings, the insouciant informality of the rock borders. I don't think I'll ever understand how Margaret has known what to do. But I have come to appreciate her rare talent for making magic happen in what might have been just another ordinary back yard.